This classic recipe is as delicious as it is beautiful! Can be prepped ahead of time and makes a great side dish or party food as well. Let pastry thaw to room temperature and lightly roll into an even layer about 1/4 inch thick. Spread a thin, even layer of cheese over pastry. Layer prosciutto in a single layer over cheese. Use a pizza cutter to slice pastry into 1/2 inch strips (or slightly thinner). Lightly rub asparagus with olive oil. 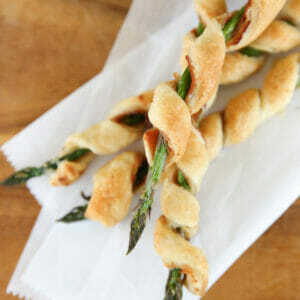 Wrap each asparagus spear with pastry, swirling up from end to end. Lay on a baking sheet in a single layer. Bake according to pastry instructions. May be served warm or at room temperature. Also can be prepped ahead of time, covered with plastic wrap and stored in fridge. Note: Ingredient amounts are approximate, these are super easy to eyeball! Great tip: Also can be prepped ahead of time, covered with plastic wrap and stored in fridge.